Sunday, June 14th â€” Checked out and drove around to the back to sit in the car and use the hotel’s wireless to book a hotel in Memphis. Ended up deciding to skip Nashville and head straight to Memphis as looked like it was going to be the best bet out of the two cities. I think we chose wisely. Besides, we didn’t want to get too behind on schedule. Our drive through Tennessee was beautiful. Was very surprised at how green the whole state was. Long rolling hills through the last of the Appalachian Mountains. As we got closer to Memphis the terrain flattened out a lotâ€”and the temperature a bit hotter. After our long day of driving, we checked into a hotel near Graceland. The top lock on the hotel door was broken and looked like someone had knocked the door in. And on the far side walls there appeared to be several patched up bullet holes (or whatever they were), a fresh coat of paint, and bits of sanded plaster on the floor. Not a good sign, but we chose to pretend as if we didn’t notice. Emma was better at this than I was. Felt a bit anxious after realizing we weren’t in a nice part of the cityâ€”but after jumping in the car to head down to Beale Street it turns out that there really aren’t many nice parts of the city. 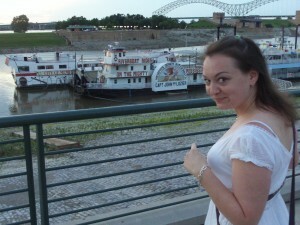 But hey, we were in Memphis! Beale Street was awesome. I guess it’s like a mini Bourbon Streetâ€”pedestrians only and lined with blues bars, clubs, and drinking in the streetsâ€”even on a Sunday night. Grabbed dinner at Rum Boogie and soon discovered that our table near the front of the stage was the perfect location for when the band came on. They played a bit of blues, but ended up turning into what can only be described as a wedding band. Looking around the place, it was tourist central. Older couples from out of town, and drunk couples in their 40s pretending to dance. But it was great. Asked for the “local beer” and all they had was Blue Moon. Technically, it is their only local beer, even though it’s no longer brewed in Memphis. Had a black and tan insteadâ€”then two more. 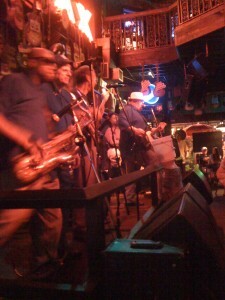 By the time we left, Beale Street was a lot quieter than when we started. 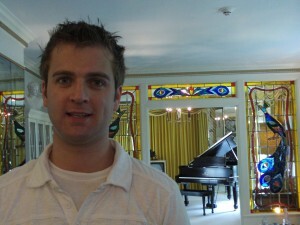 Went back to the hotel to wake up early for our visit to see Elvis at Graceland. 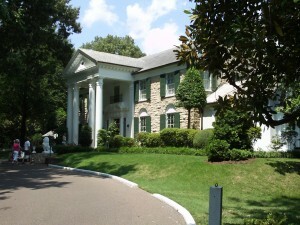 M onday, June 15th â€” It’s always been Emma’s dream to visit Graceland, and I was told by several friends before the trip that it’s well worth the visitâ€”even for those of us who aren’t big Elvis fans. It didn’t disappoint. At every turn there was a gift shop (at the attractions across the street from the mansion), and I almost bought a kitchen magnet with an Elvis recipe for peanut butter and banana sandwichesâ€”almost. Emma bought pink Cadillac earrings. Appropriate, of course. Memphis was so hot and humid that we just about melted, so after Graceland we headed back to the hotel for a nap before heading back down to Beale Street. Ended up at B. B. King’s club for more music and food. Band was much better than the night before. Had a blast. 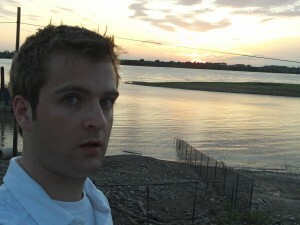 Walked down along the Mississippi before dinner to grab a few photos before sunset. Neither of us had ever seen the river before. Didn’t realize how huge it really was until seeing it in person. Lots of mud too. And boats. The sunset was gorgeous.